Unless you happen to read ancient Aramaic, chances are the name ‘Ashurbanipal’ doesn’t ring many bells. It doesn't trip easily off the tongue either (Ash-er-ban-ee-pal). However he was one of the most powerful men you’ve never heard of. This new exhibition at the British Museum introduces his remarkable story to a modern audience. For forty years in the 7th century BC he strode the ancient world like a colossus, humbly signing himself ‘King of the World’. This world was in fact the ancient empire of Assyria, carved out of lands stretching from Egypt to Kuwait and Turkey to Jordan. 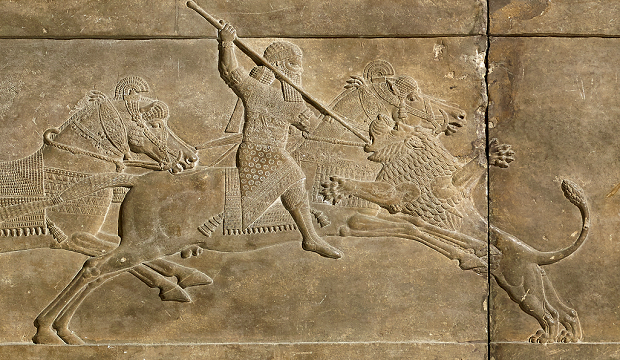 Ashurbanipal on horseback hunting a lion. Ashurbanipal was heavily invested in stamping his name on history. 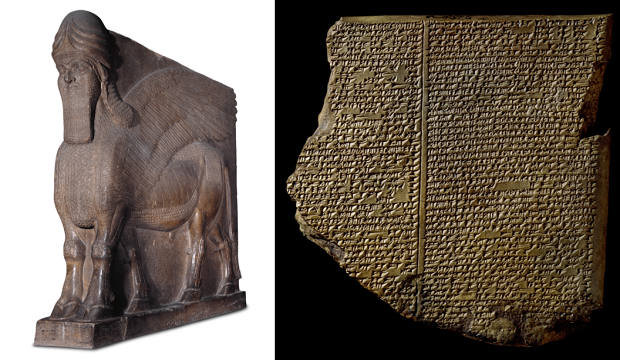 A letter written at age 13 to his father, or a boastful tablet in a palace he had built, allow the exhibition to tell Ashurbanipal's story in his own words. In pride of place are the wall carvings he commissioned for his vast palace complex in Nineveh, meant to read like the perfect royal CV. Stylised, elegant, intricate, these reliefs lose none of their ability to impress despite the passing of 2000 years, easily immersing the viewer in the king's narrative, projectors highlighting the major plot points or recreating their original vivid colours. Ashurbanipal is right at the centre of course, a giant amongst mere mortals, smiting lions and enemies astride his fiery steed with a sword in one arm, but a quill in the other. This was what made Ashurbanipal unique: at a time when rulers were meant to be grizzled soldiers, Ashurbanipal was revolutionarily proclaiming the pen as mighty as the sword. This was not mere posturing. At the centre of the exhibition lie two large bookcases, filled from ceiling to floor with Ashurbanipal's reading material, the cracked clay tablets covering a vast range of subjects in a mysterious spiky script. Ashurbanipal is thus a man of contradictions, a brutal warrior and refined scholar, capable of brutal destruction and exquisite creation. The destruction of the revered and beautiful Egyptian city of Thebes, melting down its' monuments and enslaving the inhabitants, was just as important for him as collecting books for his library, which at 10,000 works was the largest collection of its time. He is possibly the only person ever to have been both a librarian and a lion hunter, relishing the chance to gallop off into the palace grounds and strike down one of the beasts with a club before returning home to discourse with learned men on the positions of the stars. His empire was a mover and shaker, and Assyria’s strong sphere of influence is witnessed by a collection of objects from across the globe imitating the imperial styles. As far away as Italy and Cyprus, local elites sported the latest Nineveh fashions, their flowing square-cut beards and long skirts an attempt by this ancient jet-set to align themselves with what was going on at the centre of the world. Such context explains why Ashurbanipal had good reason to crow. But this pride came before a fall. Cracked tablets and defaced wall panels litter the galleries, an ominous premonition of the empire's nemesis. Less than twenty years after Ashurbanipal's death the empire fragmented, the library burned down and the city was sacked, raiders carrying away the trophies of old Assyrian conquests before razing Nineveh to the ground. What had been the largest city in the world, nestled at the centre of the largest empire in the world, became a forgotten ruin for the next 2000 years. The story is still ongoing, and recent political events are added into the exhibition’s narrative. The vandalism wrought by Isis on Nineveh’s ruins in 2015, coupled with the shocked reaction of ordinary Iraqis, show how the site still lives as a battle-ground for the country's identity. Noble endeavour this may be, but there is a bitter irony to defending Assyrian art from the merciless destruction of Isis: an elephant in the room, trumpeting out from panels lauded for their beauty yet depicting the violence and misery wreaked by Ashurbanipal on those who resisted him.